“Gateway” by Robert John 42 x 59.4, will be on show at Zari Gallery, and to be featured in LDN REiMAGINED (Unicorn Publishing Group). We are delighted to announce the launch of LDN REiMAGINED published by Unicorn Publishing Group. 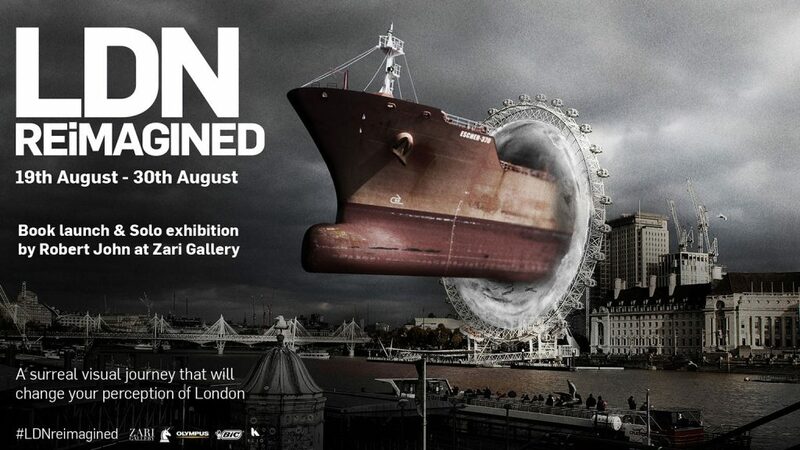 The book and show will take you on a surreal visual journey of London. The launch and subsequent show will take place at Zari Gallery, located in the heart of Central London and will feature brand new works by artist and author Robert John. London is full of landmarks that you’ll be very familiar with. From the historic St Paul’s Cathedral and Tower Bridge to the modern-day architecture of The Shard. It is a city that is forever changing and full of surprises around every corner. But there are a few corners you will never see without looking through the eyes of this book. It will show you a reimagined version of these famous landmarks that will question what you see and have you asking, what is real? “One look was all it took; we knew we had to publish this art. It breaks new ground, as inspiring as Robert is himself. If you would like to know when the book is available sign up to the mailing list using the form on this page.